Peter has been involved in music since the age of three when he first picked up a lodger’s trumpet and blew the house down – much to his mother’s surprise! At the age of 14 after auditioning for a position at The Royal Marines School of Music in Deal, Kent, he spent 4 years studying percussion. 10 years later after leaving the Royal Marine Band Peter went on to become a professional musician forming cabaret and rock bands as well as teaching percussion, until retiring in 1983 from the world of music. 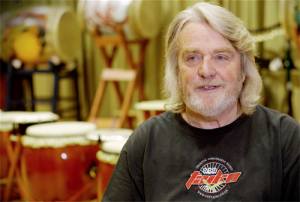 With the Taiko journey underway Peter found an extensive teaching resource from Jonathan Kirby of Kagemusha Taiko which was so beneficial and enabled CCS Taiko to be born. Keen to get started Peter acquired a selection of Pipe Drums which simulate the very expensive Taiko Drums and a selection of other different sized drums to add to the collection. 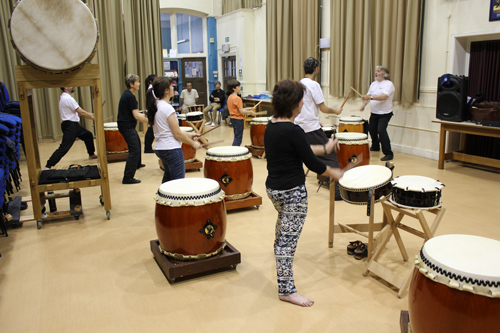 Peter who has a grandson with autism, recognised how Taiko could be beneficial to all special needs but particularly autism, as Taiko builds self-esteem, and enhances social and motivational skills. He approached the Headmistress of The Milestone School for Special Needs and offered his services as a volunteer. Three groups were established and teaching commenced for children in Key Stage Two, Three and Four. It was Key Stage Three who excelled and created a performing group. Their first performance was at their Christmas end of term assembly. 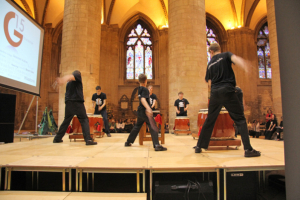 Since then they have performed on numerous occasions at school events but most notably they opened the G15 celebration at Gloucester Cathedral to rapturous applause. The audience feedback praised their discipline and focus – in particular their precisioned choreographed moves. Peter now runs regular workshops at The Colwell Arts Centre on Saturday mornings where no-one is excluded; participants range from age 8 upto 80.